EOS has spent 1,268,066 eth, currently worth more than $950 million, in the past 30 days, trustnodes is told based on a third party analysis of data provided by Santiment, an eth based ICOed project that has ambitions to become the crypto Bloomberg. “According to their SANbase analysis, approximately 1,268,066 ETH were “spent” in the last 30 days by EOS (more specifically block.one, the company behind EOS). That is roughly $1 billion (at current prices) in the last 30 days alone, and as you can see, dwarfs any other ERC-20 token,” says an analyst independent of Santiment who used their data. “A conspiracy theorist applying their own interpretation of the SANbase data might conclude that EOS is engaged in a concerted campaign to depress the price of ETH in order to promote its own interests. However… there are many potential causes for this phenomenon regarding EOS, and even some possible future implications and insights that can be taken away from analyzing the last month of EOS activity using metrics provided by SANbase. Firstly, it is important to understand what the term “spent” on the platform means, as it can be very misleading if taken out of context. The “spent” column in SANbase refers to the amount of ETH transferred out of project owned wallet addresses. SANbase uses community help, as well as help from projects themselves and Coinmetrics, to identify these addresses in a largely manual process. However, since the column data is correlated to ETH being sent from project owned wallets, rather than actually sold on exchanges or markets, underlying assumptions about a project’s motivations and intent for sending ETH will need to be carefully analyzed before coming to any conclusions. 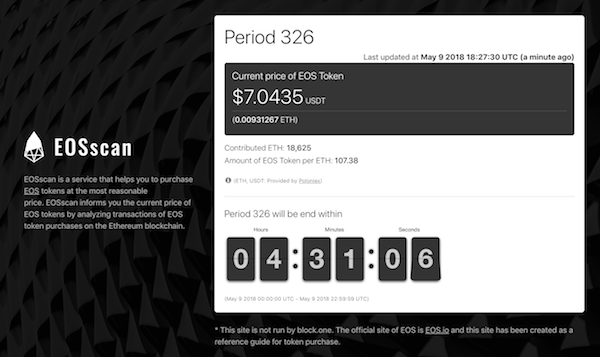 For instance, in the case of EOS, around 1,268,066 ETH were “spent” in the last 30 days, however, there may be some rational reasons for this to occur that revolve around the EOS platform and recent developments regarding the platform. Specifically, the company behind EOS, block.one, has publicly announced their intentions to commit $1 billion to developing the EOS infrastructure and ecosystem. Additionally, they recently announced several joint ventures and partnerships with EOS Global and FinLab AG, who committed $200 million and $100 million to EOS ecosystem development, respectively. Similarly, EOS launched their Dawn 3.0 pre-release on Github in early April and their ICO is coming to a close in the beginning of June, coinciding with their mainnet launch. Applying this analysis might suggest that EOS is transferring large sums of ETH internally or between partners to prepare for the mainnet launch and transition from ERC-20 to proprietary blockchains, as well as move to setup financial infrastructure support. Block.one explicitly mentions the proceeds of their ICO go to their company and can be used at their sole discretion. So, while the numbers of ETH being spent by EOS stand out significantly, logical reasons behind large sums of ETH being moved between wallets are apparent, although other assumptions about the platform such that they are selling EOS to depress the ETH price will be inevitably made. The total amount of ETH spent by EOS, which is easily the largest of any ERC-20 token, is also unique for a few other reasons. First, the EOS ICO has been huge and is estimated to be worth $2 billion. With the proceeds of that belonging to block.one, it is obvious that their transactions involving ETH will be notably larger than the vast majority of other platforms. Also, the design of EOS as a proprietary operating system environment compared to other ERC-20 platforms has crucial implications on how the platform’s funding is sent from its addresses. The vast majority of ERC-20 platforms retain a certain amount of tokens for their team and development of their own platform. Sending ETH outside of their platform that would qualify as “spent” on SANbase is not nearly as likely as with EOS. This is because as an operating system framework for building decentralized applications and platforms, in order for the block.one team to fulfill the commitment of their funding being applied to ecosystem development, they need to send those funds outside of their own wallets to help support blockchain platforms and other developments of EOS with organizations and platforms that utilize the EOS.IO software outside of their control. From this perspective, the transfer of such large quantities of ETH outside of the EOS wallet might appear less nefarious. Finally, if EOS was “dumping” these sums of ETH (instead of just transferring them to other wallets), we would potentially find a correlation in the price of ETH over the same time period. However, it doesn’t appear that the ETH price has been depressed by this action, given its increase by ~60% in value since the beginning of April, with around $2-3 billion on average in 24 hour volume according to coinmarketcap over the latter half of the month. Price, of course, depends on demand and supply. One can sell a million eth, and if demand is higher than that level, price can still rise. That does not mean the eth were not sold or that the eth sale had no effect on price by perhaps making it rise more slowly than it could have done. Something which applies especially as many of the eth moved was sent to Bitfinex. The interesting revelation here is that the proceeds go to block.one specifically, a for profit company with Brendan Blumer as CEO and Daniel Larimer as CTO which was initially funded by Blockchain Capital and Tally Capital. They have apparently moved $1 billion worth of eth in just 30 days, either by liquidating it into fiat or by sending it to wallets where they have more control or are more obscured. What exactly they will do with such huge sums of money for barely a start-up which did not exist even a few months ago, remains to be seen, but the ICO is to now finally end, and the first version of EOS may launch barely a year after development in the next few weeks. “Some other key metrics they provide are the token burn rate and daily active addresses. Burn rate describes the movement of tokens between addresses, which can be useful in identifying large amounts of tokens being exchanged from addresses that have been latent. The EOS platform has been the most active in daily active addresses over the last 30 days with ~12,800. The burn rate increased substantially over the course of April, especially in the beginning and end of the month. With the EOS price rising ~300% in April, it becomes apparent that naturally the burn rate would increase as well, as people holding tokens during the bear market begin to send them to exchanges to make profits. Obviously no one can really say what exactly is happening with all that eth because block.one is not providing any public disclosure to clarify where all this money is going. But as they suddenly find themselves with so much money, they’d probably want to spend at least some of it, like a billion. Hopefully responsibly, although a lambo here and there, or indeed maybe half a country, wouldn’t surprise us.